The multi-information display shows the odometer, trip meter, outside temperature indicator, and other gauges. It also displays important messages such as warnings and other helpful information. 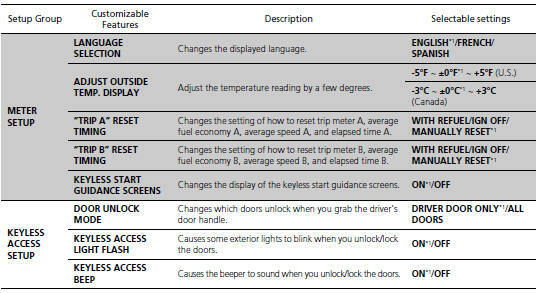 Press the / (information) button or the SEL/RESET button to change the display. The temperature sensor is in the front bumper. Road heat and exhaust from another vehicle can affect the temperature reading when your vehicle speed is less than 19 mph (30 km/h). It may take several minutes for the display to be updated after the temperature reading has stabilized. Use the multi-information display's customized features to correct the temperature. Adjust the temperature reading up to ± 5°F or ± 3°C if the temperature reading seems incorrect. You can change the way the average fuel economy is reset. Press the / button to select CUSTOMIZE SETTINGS while the power mode is in ON. 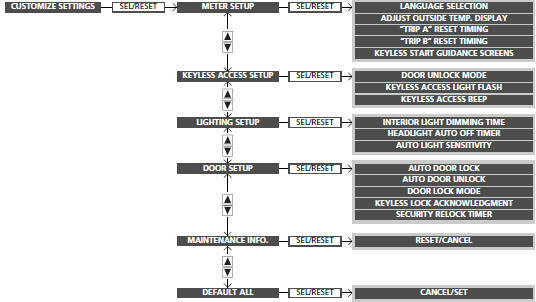 Press the / button to select CUSTOMIZE SETTINGS and press the SEL/ RESET button. 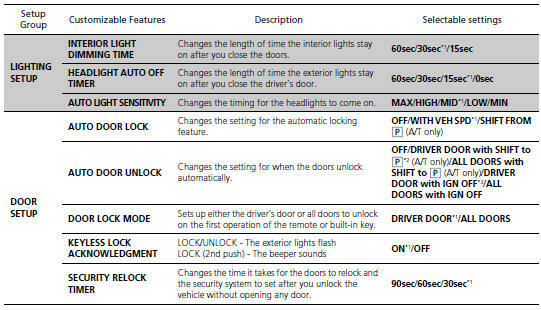 The steps for changing the “TRIP A” RESET TIMING setting to ON are shown below. 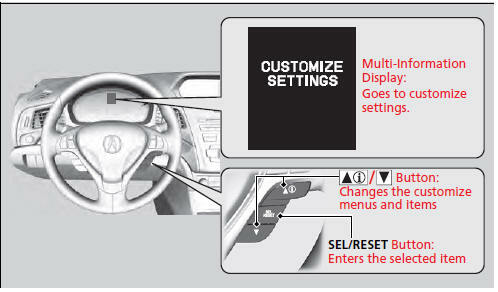 The default setting for “TRIP A” RESET TIMING is MANUALLY RESET. 1. Press and release the button until CUSTOMIZE SETTINGS appears on the display. - LANGUAGE SELECTION appears first on the display. 4. 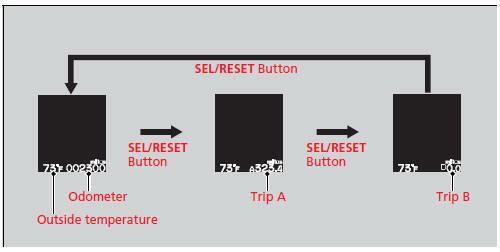 Press the button until “TRIP A” RESET TIMING appears on the display, then press the SEL/RESET button. - The display switches to the SETUP screen, where you can select WITH REFUEL, IGN OFF, MANUALLY RESET, or EXIT. 5. Press the button and select MANUALLY RESET, then press the SEL/ RESET button. - The MANUALLY RESET setup screen appears, then the display returns to the customize item screen. 6. Press the button until EXIT appears on the display, then press the SEL/RESET button.